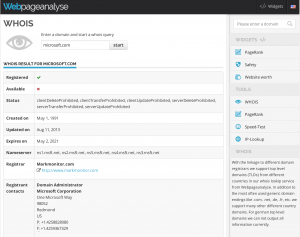 During the development of our WebPageAnalyse project we wanted to give users the ability to find WHOIS information for any domain they like. I tend to do WHOIS for a domain on a regular basis to check who is the owner of a site, i.e. if I need to contact them if they put up some links on their site which they should not. I used a multitude of tools in the past but was never satisfied with them because I always wanted to have the WHOIS information returned in a structured way so I can actually read and understand them. Normally you just get a simple text page back. We decided to enhance this and actually parse and enrich the WHOIS data if possible. As a basis for this we use the Ruby WHOIS library. We take the results and display them in a user friendly format. We support top level domains (TLDs) from different countries and in addition to the most often used generic domain endings like .com, .net, .de, .fr, etc. we support many other different country domains. For german top level domains we can not output all information currently as the DENIC is not allowing that. Check out the Whois Tool and give some feedback if you like it or not.